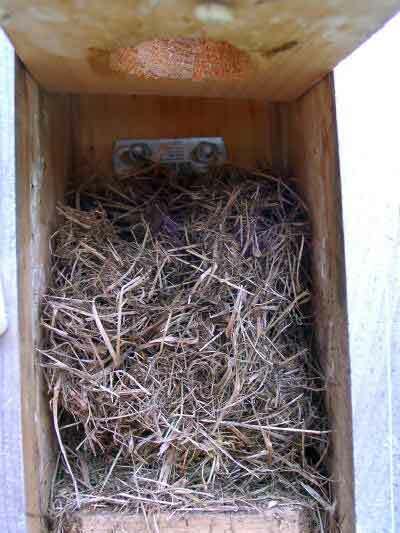 Grass (in northeastern CT) appeared in a NABs box around 7/20, one to two weeks after a second brood of bluebirds fledged from this box. It started out about 2" deep, then was gradually built up. It consisted entirely of loose, almost fluffy grass clippings (green and dry)- with no other material such as seed heads, trash or feathers. There was nest cup or eggs, or evidence of anything sitting on it and smashing it down. 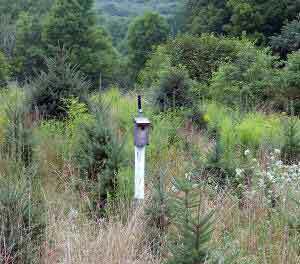 The box is outfitted with a PVC pipe predator guard (without a cap) on a metal pole, with the entrance hole about 5 feet off the ground. No cavity nesters were seen in vicinity other than bluebirds. (I have had downy woodpeckers roost in this box but they never brought anything in with them.) I did see a female house finch perching on top of the box. One suggestion was a flying squirrel (known to be in this neighborhood). Depending on the air current, they can glide 150 feet or more from a tree, and can squeeze through a 1" hole. However, according to the CT DEP, their nest may be lined with shredded bark, leaves, moss, feathers, and other materials. None of these materials were evident in this box.